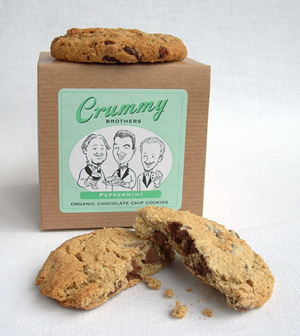 When two blogger friends and an editor pal of an influential daily newsletter all espouse the magnificence that is Crummy Brothers Cookies, I just had to try them out for myself. After getting samples of the entire product line, I of course went hand-first into the original chocolate chip box expecting nothing but utter brilliance. Sadly, I was a slightly disappointed by the crumbly cookie made with all organic ingredients. Undettered, I pushed on and tried the remaining 6 flavors in the product line. And that's when I was won over. Completely. With exotic combinations like Saffron Pistachio, Orange Blossom and Lavender, the Crummy Brothers have tapped into a, well, untapped commodity with these distinct nibbles. But when I opened the box of Lemon Ginger (two flavors I'm generally turned off by when it comes to sweets) I couldn't believe the gorgeous aroma wafting from the box. And the taste matched. I do have to say that some of my favorite cookies in the world are Thin Mint Girl Scout Cookies. So when I sampled Crummy Brothers Peppermint Cookie, with organic cocoa, organic butter and organic peppermint, I nearly fell off my stool. How close in flavor but in a much larger presentation -- and no doubt so much healthier due to the organic cooking process. Nice job Crummies. And love the packaging to boot.